OLD VERSION: The ant works hard in the withering heat all summer long, building his house and laying up supplies for the winter. The grasshopper thinks the ant is a fool and laughs and dances and plays the summer away. summer long, building his house and laying up supplies for the winter. The grasshopper thinks the ant is a fool and laughs and dances and plays the summer away. Then Rev. Jeremiah Wright has the group kneel down to pray for thegrasshopper's sake. Columbus, and the Pope for the grasshopper's plight. 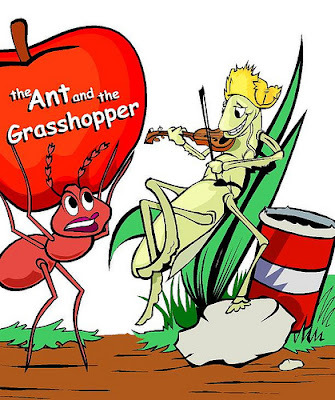 Nancy Pelosi & Harry Reid exclaim in an interview with Larry King that the ant has gotten rich off the back of thegrasshopper, and both call for an immediate tax hike on the ant to make him pay his fair share. left to pay his retroactive taxes, his home is confiscated by the Government Green Czar and given to the grasshopper. over by a gang of spiders who terrorize and ramshackle, the once prosperous and peaceful, neighborhood. The entire Nation collapses bringing the rest of the free world with it.